Create a modern look in your home with this luxurious arm chair. 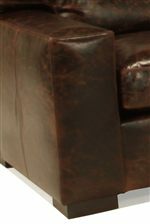 Plush seating, and quality construction will make this piece a favorite. Wide track arms and large block feet make a modern statement. Made in America, this upholstered arm chair will quickly become a staple in your living room. The 0870 Contemporary Upholstered Chair with Wide Track Arms by McCreary Modern at AHFA in the area. Product availability may vary. Contact us for the most current availability on this product. Leg or Skirt Oversized block feet, available in a variety of wood finish options.